Dualitik are one of the scenes biggest and best producers. Hailing from Spain this duo are recognised for their quality and ability to cross genres whilst still keeping their sound techno. They have even worked together with Yin Yang label owner and producer Pedro Delgardo. Brain Controller is their finest work to date. A superb techno beast that can be played by anyone. Its techno with that appeal to everyone. Excellent vocals chanting I am the brain controller sprinkled through the track with an excellent riff combine for the hit of 2015. OK LETS BE FAIR.. ITS A HUGE BOMB. In 10 years, this will be seen a classic. FO' SURE! 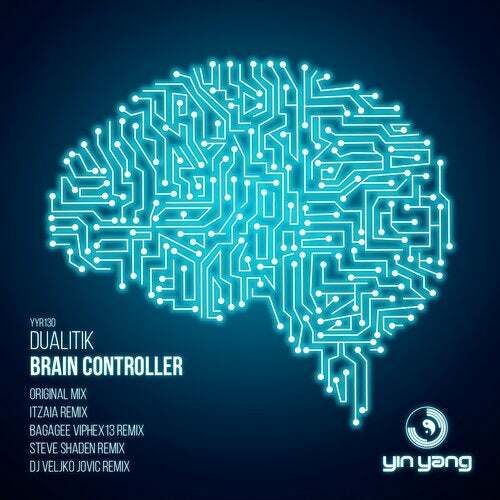 The original is complimented by some fantastic and just as large remixes by the Yin Yang crew. Itzaia remix.. Well this guy NEVER ever fails to deliver, this is an outstanding piece of tech. Pumping floor filling.. AN ANTHEM for now and for the future..
Bagagee Viphex13 - Baggage is one of South Koreas biggest artists, he is also a true dedicated Yin Yang resident, sporning the sound that is now. This remix is just pure class, crystal clear and utter dance floor rocking stuff. This has to be some of his finest work. Steve Shaden - Well this remix is super fresh and in the usual Shaden tough techno style. He always delivers dance floor destroyers with his killer style. This young Italian surely is on his way to the top in hard techno. Amazing. Simply amazing. DJ Veljko Jovic - Well how far has this gent come this year? WOW. This has to be his best track and remix to date. That rolling bassline and great use of the samples has made this a badass remix.. I love it. We love it.. I think you will too..